The Swede and I went to our first home open on the weekend. I am considering that a win. The first was a small 1920s number on Brisbane St. It would not give us any more room than we have in the Wellington St Warehouse and while I like the concept… and the grand piano presumably hired to make the room look big in photographs… the Swede said a word in his native tongue I wasn’t familiar with and that was the end of that. The next was a creative five-level (seriously) townhouse on the near side of Walcott St – technically North Perth but within very close walking distance to Andrew, Elle and Evelyn, and the famous wine shop. Small block, cool house with lots of rooms. Kind of industrial feel to it. Newish. More Swede than me, although it had a LOFT WITH A LADDER. The romantic in me did like the ladder. I said the next step was to still have a job after the March 9 election. Apparently that wasn’t what he meant, and the very helpful Commonwealth Bank has a step-by-step guide which says the next thing we need to sort out is finance and a conveyancer. This sounds scary, and has already raised a series terrifying conversation topics with the Swede. If anyone readers has recommendations on this, let me know. That will be this week’s task. – SpAnna spent a year looking at more than 200 properties before buying her flat in London. Where she does not live. Looking can be time consuming, apparently. – Jonesy told me to buy a house boat. – Nick said get a fur-child first, then fit the property to the animal. The good news is, the advice that has come in via the blog and facebook has been just… awesome. Awesome. I hope other people going down this path have mates like you guys. Kate, you’re absolutely right, although in WA realestate.com.au actually has the bulk of the market. 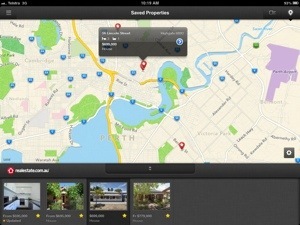 The realestate.com.au isn’t as intuitive as domain.com but it’s still incredibly useful. I downloaded this onto the ipad and it has made the process of hunting, saving, comparing and inspecting about 1000 times easier. It also means no matter where you are, you can look around and see what’s for sale nearby. We had dinner in East Perth last night and were admiring a property for sale across the inlet. We looked it up online and took a tour using the app…. Awesome fun. So this is my tip for new players: If you’re buying a house, buy an ipad first. It might seem expensive, but in the context of a $500K+ purchase… not so much. Su said: Do drive-bys before inspecting, don’t look at anything that’s been on the market too long. and take trusted friend who speaks their mind who has house-buying experience. Su – This has already knocked out some houses we’d otherwise make the effort to inspect. When I get to the pointy end of this stuff, would you please be my experienced friend? Sara said don’t bother with a buying agent, they cause more problems than they solve. Trav said use a buyers agent for an investment. This has confirmed my thoughts that a buying agent for a home isn’t perhaps the way to go, but if I’m looking for a smart investment for a place I won’t actually live in, then an agent is a good idea. Jo said: Buy your second house first. Buying and selling costs so do it the fewest possible times. Jo has a great blog here about life, cooking and living like it’s a 60s era sitcom that I love. I think (although I’m not sure) we’d like to buy a house we can hold on to and rent out as an investment down the track. Then we can keep saving and investing in the stocks and theoretically, use those investments to get a deposit sorted over the next five years for our second house. Your advice, as it has reliably been since 1989 when you told me fish plaits caused too many knots, is brilliant.